Anirban Ray Choudhury, my former editor at The Quill & Ink e-zine (where at his invitation a few years ago I published some essay, fiction, and translation), has recently informed me that he is reviving that project under a new name and in a different format. The Quill & Ink is now Fabula Press (www.fabulapress.com) and the plan is, with his partner Rajeev Pareek, to host a quarterly writing contest and, with the results of each one, publish a print anthology that will be available for purchase at a number of online bookstores. By taking a modest $10 entry fee for submissions they will be able initially to pay out between $100 and $150 to the top three stories and offer publication to a number of others: each issue may contain 12-15 stories. When Anirban approached me about this new venture, he asked if I would volunteer to be one of the four judges. I have accepted and am anxious to see the project succeed. The first competition, the Aestas Short Story Contest 2014, is set to accept online submissions between May 20 and June 20 at 11:59 p.m. (Hong Kong time) on the theme of Summer (aestas being the Latin word for that season). The theme may be interpreted broadly on a range between strictly literal and strictly metaphorical and, after a first round determined by the editors, will be judged according to a 9-point set of criteria and the scores of the four judges taken together. The judges will receive the stories without authors’ names on the manuscripts, so anyone reading this who wants to submit should not worry about a conflict of interest. I encourage all of my fellow writers to check out the complete guidelines at the website and give the competition a shot! 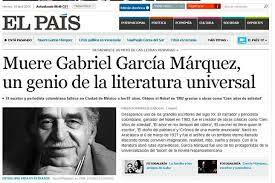 It hasn’t been but two or three weeks since I heard about the death of Gabriel García Márquez, the Colombian winner of the Nobel Prize for Literature and acknowledged master of the magical realist style of writing which started in Latin America. A rejection of pure journalistic realism and objectivity, in a quest for the deeper significance of human experience, it instead starts from a core of the ordinary, the mundane, and the “real” and wildly exaggerates it, as Chilean writer Ariel Dorfman points out in a remembrance in the issue of The Nation (5/26/14) that just arrived this week in my mailbox. Since I began reading García Márquez in Spanish some thirty years ago, I have been a deep admirer in particular of his short stories; and have also especially loved his historical novel The General in his Labyrinth, about the South American liberator Simón Bolívar, and the romantic novel Love in the Time of Cholera. Just a couple of months ago I finally polished off The Autumn of the Patriarch, which was recommended to me long ago by fiction-writing professor John McCluskey, Jr. and my former high school English teacher Margaret Meadors; and for most of three decades has been sitting on one of my bookshelves. It is indeed quite a remarkable achievement. But I am embarrassed to admit – and all the more so after reading Dorfman’s account of devouring it in about 24 hours of marathon reading, just before its official release in 1967 – that I still have not made it all the way or even half way through One Hundred Years of Solitude, which is largely considered to be García Márquez’s masterpiece and one of the great literary achievements of the 20th century. I did, while still an undergraduate at Indiana University, read James Joyce’s Ulysses, in an extremely profitable independent study with Professor Brian Caraher (who has since then found his way to Belfast where he is a Chair at Queens University); and just recently I have finished volume two of the new translation of Marcel Proust’s monumental seven-volume novel In Search of Lost Time (formerly In Remembrance of Things Past), which I have long intended to read. 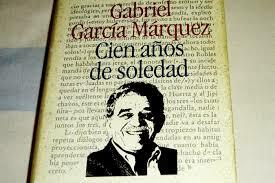 But I have never been able to get through more than a quarter of García Márquez’s most celebrated novel, which for whatever reason seemed to lose my interest after the initial excitement of it. In any case, the result of Dorfman’s unintended shaming is that I have pulled it off the shelf and resolved to not put it back until I have conquered it. I had thought that maybe I should try it in Gregory Rabassa’s undoubtedly brilliant translation, but not having it at hand have instead pulled my Spanish copy off the shelf. Perhaps at this moment I am more prepared for it than I was all those years ago. Speaking of magical realism, I have just this past week finished reading – in the masterful translation of Keith Gessen and Anna Summers – a very accessible collection of Russian stories that might somewhat fit under that classification. The author is Ludmilla Petruvshevskaya and this selection of her stories is called There Once Lived a Woman Who Tried to Kill Her Neighbor’s Baby: Scary Fairy Tales. She also has already published (in Anna Summers’s translations) a couple more collections of short fiction, more strictly realistic in style; and a novel, supposedly her own master work, forthcoming in the fall — which already exists in a reportedly inferior earlier translation, so beware! (my source for that is an article, also, in a recent issue of The Nation). These selections have a particularly mystical quality, and perhaps to some extent have more in common with the moral folk tales that Tolstoy invented or re-told in his later years than with García Márquez’s (one story in particular, “The Old Monk’s Testament,” brings the best of those Tolstoyan folk tales to mind). Her style is more sharp-edged than Tolstoy’s and more spare than García Márquez’s, but they are always rich in voice and description. Of course all such comparisons are at best approximations. Petrushevskaya, whose work as a dramatist helped to support her in the years that her other work was banned (though none of it explicitly political), is certainly the most critically renowned living Russian writer after the death of the more internationally famous Alexander Solzhenitsyn; in fact, her first story published in Russia, “The New Robinson Crusoes,” which appears in this volume, was published alongside Solzhenitsyn’s famous account of the Stalinist prison camps called The Gulag Archipelago. While no longer banned, Petrushevskaya remains controversial since as the translators comment, “Many Russian readers cannot forgive the unremitting bleakness (even if it was always mixed with profound sympathy and hope) of her early work” (perhaps that is also why she was originally banned, since the vision of Russian life she revealed did not reflect so well on that particular Utopia of the Proletariat). I might add, in any case, that the stories in this selection certainly transcend any bleakness as they reflect what, at the risk of falling into a cliché, I will call “the triumph of the human spirit.” I highly recommend them.